For the community members of the Town of Morris, the word Stampede holds a different meaning than it would to many others. Tradition, history, spirit, legacy, tourism and rodeo are just a few that come to mind. But the most important for many of us would be pride. Pride in an event that brings everyone in our town together each year and has created such powerful memories for both local residents and visitors. The Manitoba Stampede as part of the Valley Agricultural Society started back in 1962. It started as a dream to host the largest rodeo east of Calgary. It started with a handshake between the president of the Valley Agricultural Society and the Rodeo Stock Contractor. It started with commitment, energy and ambition. The first rodeo was set for July 1964. Spring of 1964 was a flurry of activity in the Town of Morris. The track was put in place and our great grandstand was built. The original grandstand was built to accommodate 6,200 viewers with another 3,600 patrons at ground level seating. Bolts for the grandstand were all handmade in the neighbouring community of Lowe Farm. Volunteers worked to the last minute, hammering the last nails as patrons were arriving to the show on July 16, 1964. This grandstand provides seating for tens of thousands of patrons who attend our Manitoba Stampede every year and we are fundraising to revive the grandstand back to its glory days. Over the past 52 years, our grandstand has stood tall and strong, marking past, present and future rodeos. However, this grandstand is feeling the effect of the harsh Manitoba winters, and the hot, humid Manitoba summers. The seating area has seen better days and is in desperate need of repair and restoration. We have received a quote to repair broken boards and provide a fresh coat of paint in the amount of $60,000. The outside of the structure is seen daily by thousands of motorists as they pass through town on Highway 75 and Highway 23, and a refreshed look would go a long way in attracting new visitors and generating some positive word-of-mouth advertising for the Stampede. 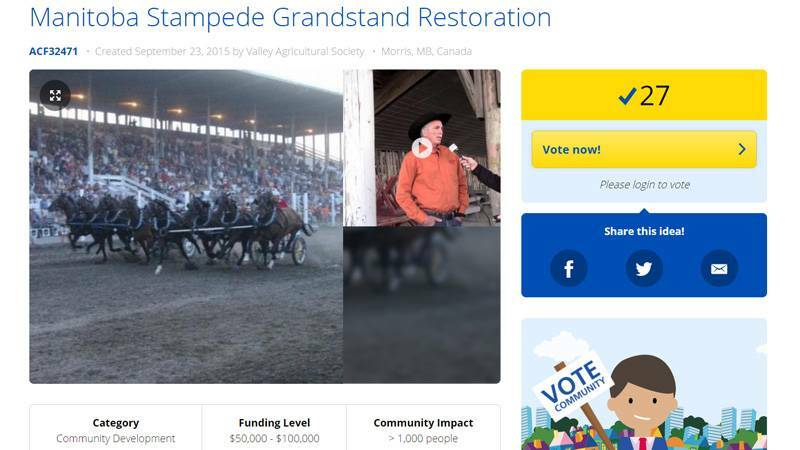 The Valley Agricultural Society, a member of the CPRA, has done an amazing job with keeping our Stampede tradition going for over 50 years, however there is not enough funding for a major project like this. And unfortunately the reality of it is, if we don’t do something about this soon we could risk some serious damage to the structure in the coming years that could have a major impact on the future of our event. For many of us community members, the Stampede is a huge part of who we are. Some of us have been members of the board which has existed for over 54 years and have helped grow the tradition. Some of us grew up attending the event each year with our parents who went on about its history and their place in it. Some of us are now just starting to experience the joy and wonderment that comes along with 4 magical summer days that bring horses and excitement to our little town. These are the memories that we hold dear, and the ones that we want to continue creating for the future. This restoration would make the rodeo experience exponentially more enjoyable for visitors each year, and also help to draw in new faces who may have heard about the newly renovated seating or have seen the freshly painted grandstand on their drive through town. But more than that, it will restore community pride in this historical structure and allow us to carry on the tradition of the Manitoba Stampede.